In a recent short video filmed by Producer Porter Speakman Jr. he posted a film for the Christ at the Checkpoint Conference 2012 website. According to the CATC2012 website this piece “The Checkpoint” looks at “the system of Israeli checkpoints in the West Banks and the daily routine Palestinians must face going through the Bethlehem Checkpoint.” Here is the film for your viewing. I admit the film is an emotional look into the daily lives of Palestinian workers who have to pass through Israeli checkpoints on their way to work. The raw feelings of Palestinian men going through the Checkpoint is accurately filmed by Speakman. Yet there appears to be major disagreement among Palestinians whether or not they are being degraded as “slaves” or they are merely “workers” who should have pride in themselves. Sometimes a Palestinian worker must arrive at the checkpoint at 5 am to make it to work by 8 am. One cannot walk away from the sadness of this situation without some compassion for the Palestinians. However, is their dilemma the fault of the Israelis or due to the past and present terrorist behavior of some their fellow more extremist Palestinian brothers? Speakman, like left wing documentarian Michael Moore, has a knack for showing his audience exactly what he wants them to see to prove his point. The filmmaker lacks the objectivity to fairly film both sides of the situation but only portrays the difficulties Palestinians have to face passing through the checkpoint. The Speakman video gives the viewer the idea that the Israeli checkpoints have nothing to do with security for the Israeli people. The checkpoints are merely set up to harass Palestinian workers. That’s a blatant lie and a misrepresentation of the intentions of the IDF. The filmmaker even interviewed a few Israeli soldiers who once worked at the Checkpoints and admitted how hard it was. Of course, Speakman, as the film’s editor, has the authority to keep what he wants in the documentary and to edit out what he doesn’t want. So we will never know the content of the entire interview with the Israeli soldier. Whatever an Israeli interviewee states in a live interview in front of Speakman’s rolling cameras must pass through the biased mind of Porter Speakman who has demonstrated his anti-Israel bias in the propaganda piece With God on Our Side. Speakman has a knack for placing historical inaccuracies in his film which he hoists on uneducated evangelical audiences who are unfamiliar with the history behind the Middle East conflict. Read for yourself the excellent critique of With God On Our Side by Dexter Van Zile at the New English Review. One cannot even begin to discern the dishonesty of this film without reading Van Zile’s piece on Porter’s Michael-Moore like filmmaking on the Israeli-Palstinian conflict. Regarding the “Palestinians at the Checkpoint” film associated with the Christ at the Checkpoint Conference, Porter Speakman fails to interview one Israeli soldier who is presently working at the Checkpoints to ask them why they are putting the Palestinians through such thorough screening. Is the IDF merely out to harass the people of the Palestinian territories or are they concerned about the security of the State of Israel? Why didn’t Porter ask the IDF soldiers if they have confiscated any weapons or any kind of devices that could be used to harm Israeli citizens? Is he afraid of what he might find? Are Palestinians carrying instruments that can be used as weapons against Israeli soldiers and civilians? 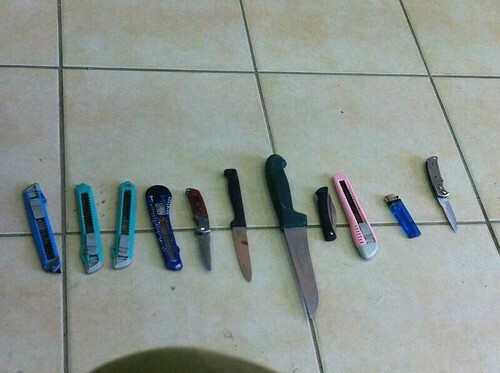 Suprisingly, last week the IDF photostream on Flickr displayed a photo of knives used to stab an Israeli soldier. The photo was posted March 23, 2012. Why didn’t the filmmaker deal with this very serious issue that affects the way IDF soldiers handle Palestinians at the Checkpoints? Sorry to inform the Christian producer but the IDF Checkpoints are not meant to solely harass Palestinians on their way to work. The security checkpoints are meant to examine individuals crossing the border to work in Israel for weapons. Let us not forget these individual are part of a culture of terrorism – a people who elected the terrorist group Hamas to rule over them. If the Palestinians do not like going through the IDF Checkpoints, perhaps they need to find work in the West Bank and not go into Israel. If there is no work, then why aren’t wealthy Arabs who sympathize with the Palestinian cause investing money into the territories – the same money that has been invested into the most decadent spot in the Islamic Middle East – Dubai?